Below you will find many of the questions we are frequently asked about Dynamic Plastics and our services. Click on a question to display the response. If you don't see your question listed below, please feel free to contact us directly. How long has Dynamic Plastics been in business? Dynamic Plastics was incorporated in 1993. What are Dynamic Plastics core competencies? Dynamic Plastics is considered an industry leader in the construction of prototype and low volume production plastic injection tooling as well as prototype and low volume production molding of thermoplastic injection parts. For the benefit of our customers, we also offer a variety of value added services. What quality systems does Dynamic Plastics comply with? Dynamic Plastics is ISO 9001-2008 certified, ITAR registered and UL registered. What size parts can Dynamic Plastics produce? Dynamic Plastics has molding presses that range from 75 tons to 500 tons in clamping pressure. That allows us to mold parts ranging from the size of pencil eraser up to about 16 inches square, depending on the type of resin used. For parts that are too large for a 500 ton press, we have aligned ourselves with a reputable molding source in our area. Is there a minimum part order size? No, Dynamic Plastics will accept any size part order. On orders where the volumes are low, a set up charge will typically be applied and will be noted on our quote. Set up charges cover the cost of having the mold set in the press and the time our operators spend establishing a process, and they help to cover the initial buy of material that is often required for low volume runs. Can I get my parts in custom colors? Yes, Dynamic Plastics works with a number of custom compounders. For custom colors that require us to have a compound developed, a one-time colorant fee is assessed to cover the color match and initial buy of colorant. From that point forward, the cost of the colorant will be included in the quoted part cost. In cases where you are able to use a color that we have already had developed and matched for the resin your part requires, the colorant fee may be waived. What type of resin should I use for my part? Although Dynamic Plastics does not recommend the type of resins to be used by our customers, we are happy to provide you with a basic resin guide to outline some of the more popular resins and some of their characteristics. If you would like additional information, we've included resin links in the guide that can direct you to technical help from the various resin manufacturers. Does Dynamic Plastics build its tooling in house? Yes, for the vast majority of projects Dynamic Plastics builds the tooling entirely in house. Use of outside sources is generally limited to specialty machining or certain secondary operations that we manage for our customers. What type of tooling options do I have? For our customers' convenience, we also utilize a custom quick change base that is similar to a MUD base type unit when possible. The use of this base allows us to machine the part shape directly into inserts that are loaded into the base for molding, which eliminates the need for a free standing moldbase for that particular part. This molding method saves our customers money by eliminating the cost associated with building a complete moldbase for each small part. What size part footprint will the custom quick change base accommodate? The custom quick change base will usually accommodate parts that are up to 2 1/2 inches wide and appoximately 8 inches long. Other factors, such as whether side actions are required or not, may also apply in determining if a part is a candidate for this type of base. How many parts will the different tooling options provide? 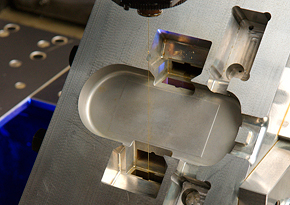 The amount of parts a mold is able to produce will vary based on a number of factors (such as part geometry and whether the resin used is filled or unfilled with glass or other additives). A typical range for an aluminum tool with unfilled resin would be 50,000 to 100,000 pieces, or 5,000 to 20,000 pieces when a filled resin is used. For P-20 tooling using an unfilled resin the range would normally be from 250,000 to 500,000 pieces, and 100,000 to 250,000 pieces with a filled resin. For hardened S-7 production tools, the range is a million pieces and above. Do I need to buy a new mold when the guaranteed tool life is reached? No. Our guaranteed tool life is just the point we anticipate the tool will need reworked in order to continue providing high quality plastic parts. The rework cost is generally far less than the original cost of the tooling, and will often extend the tool life by the original amount that was guaranteed. What is the price difference between aluminum and P-20 tooling? Although each case is different depending on part geometry among other things, a good estimate is usually about a 30 percent difference in tooling cost.